Of all the watches I have in my tiny collection, there are a select few which I consider to be modern day classics. The IWC Pilot Chrono 3717 ranks among one of them. In fact, I've long considered it to be the be the Alpha among my little squad of elites. It boasts a perfect marriage between modern lines and classic curves. A perfect blend of the retro-vintage look with a modern touch that kind of ensure it's evergreen status. I've had it for about 4-odd years now and I don't seem to ever tire of it. Then came the usurper. In a nutshell, the Laco Kiel is essentially a case of love at first sight. I caught sight of it when Anders of Gnomon was unboxing his latest delivery a couple of months back. the Kiel did not even had the opportunity to show off it's glorious curves. I snapped it up as soon as Anders took it out of the box. It did not even have the opportunity to live out part of its life in the display case. How do these two stack up against each other? Before we move to that, let's take a look at their similarities. For a start, these two look like twins separated at birth. Identical dial layout, day/ date window locations just to name a few. 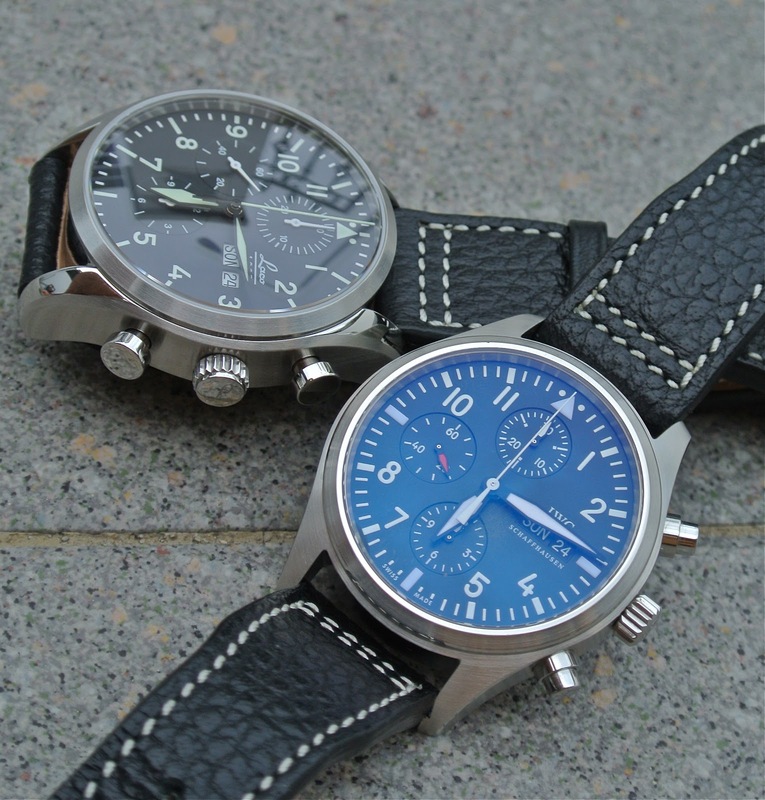 Both are pilot-themed chronos. They are powered by the efficient Valjoux 7750 work horse. But the two are not exactly twins. Let's place the Laco Kiel under the microscope first. The Kiel is the larger of the two at 42mm. It is also chunkier than the 3717. In fact, it looks closer in thickness to the IWC Pilot Chrono Double chrono. The pushers are similar to those found on the IWC Portuguese. The crown is the standard push-in type. The day window shows the day in German. The case hosts a mix of both polished and brushed surfaces. What I really like about the Kiel are the curves. Especially the lugs when viewed form the top. The curves blend in exceptionally well with the relatively huge case. The lugs extends naturally from the perfect circle of the case. One peeve, however, is the minute hand. It's a tad too thin. Looks out of proportion to the fatter hour hand. Thanks to the larger case, the dial does not look too cluttered or busy. Now on to the 3717. This has a smaller case at 42mm. However, I fell that it looks smaller than a 42mm somehow. Pushers are the standard piston type. The 3717, however, comes with a scre-down crown. the dial looks somewhat busier than the Kiel although both adopted the same layout. This is due to the smaller case size. The lugs on the 3717 are straighter and protrude from the case. It does not look as seamless as the Kiel, in this sense. The Kiel comes with a see-through case back. The lightly decorated rotor takes up most of the window. The usual inscription borders the stainless steel of this rear window. However, I'm not a fan of exhibition case backs. Firstly, as I mentioned earlier, the rotor takes up much of the window. Secondly, this is just another Valjoux 7750. Unless it's an in-house movement or a 7750 with major modifications, I reckon this is unnecessary. Thirdly, a transparent case back would mean there is no anti-magnetic capabilities on this pilot watch, which, as far as I was told is one of the key elements in a pilots' watch. Sticking to its formula of simplicity, the design team at Schaffhausen has chosen to keep the case back of the 3717 simple. Only the serial number and the unabbreviated brand name of its creator are etched on the brushed case back. Unlike the Kiel, the Valjoux 7750 in this piece is encapsulated within a Faraday cage constructed of soft iron. In average Joe speak, this means it's equipped with anti-magnetic capabilities. AS you can see from the photo above, the lugs on the Kiel (right) are broader and curved sharper than the 3717's. Furthermore, the lug holes are set higher up the lug. This allows the watch to wrap around the wrist to ensure a more comfortable fit. This also means there is little overhang if worn on a smaller wrist. The 3717 have straighter lugs but this makes the watch seem slightly larger. If the lugs are surved too much, it might make the watch appear rather small. My peeve with the 3717 lies in this area. Firstly, with the lug size at 21mm, this means one has limited strap options. Most would head back to Richemont and leave the service centre about SGD700 poorer. Yes, that's how much the original croc straps cost. Fortunately, I managed to fine replacement straps that fit perfectly (21mm). Although these are not croc straps, I reckon they match the watch better, actually. The other peeve is the spring bar. The single collar stock spring bars are a nightmare to remove. They are set about a quarter of the way down the spring bar. This makes strap replacement a chore. AS you can see from these shots above, the Kiel is perfectly shaped from the side. The curves looked naturally bent and are flawlessly and seamlessly constructed. The 3717 looks slimmer in comparison. looks more like a dress watch in this sense. However, I dislike the crown on both watches. Although well grooved, they are too tiny. It's very difficult for someone with stubby fingers and well bitten-off nails (like mine), to operate. On the lume front, the Kiel beats the IWC hands down. They are as bright as charged neon tubes. Crisp and clear. The lume on the 3717 is bright but pathetically spartan. On the wrist, the Laco commands presence. Despite my 6 3/4" wrist, it looks masculine but not overly huge. the curved lugs contours to my wrist perfecely with zero overhang. Due to it's smaller size, the 3717 looks like a perfect fit on my wrist as well. I've done one test on the power reserve of these two watches. Interestingly, both surpassed the official 42 hours specified by their makers. The Laco Kiel ran out of gas after 51 hours. The 3717 ran on for a further 3 hours and rested after its 54-hour marathon. Not sure what modifications the folks at IWC did but it sure has a larger gas tank. Both are drool-worthy timepieces. Each is a winner in its own right but the finishing on the 3717 is slightly better. The finishing on the Kiel is no slouch either. Though both are not perfect, they are noteworthy gems. If I had not bought the IWC much earlier, I'd have just settled for the Laco, which is priced almost 50% cheaper. At the price they are charging for the Kiel, it's a steal. Power reserve : +/- 42 hours (stated), 51 hours (actual). Power reserve : +/- 42 hours (stated), 54 hours (actual). + Case and lug design (curved lugs). + Value for money (much cheaper than the IWC). + German day window (unique). + Versatility ( can be used as a dress watch or as a sporty number). - Bright but spartan lume. - Difficult to remove spring bars. Would you believe I work in a pawn shop. Hahaha! A very good review for a fantastic watch. I was smitten by this Laco Kiel last year and it is in my collection since. A very well-made pilot chronograph in every sense, wrapped in a beautiful case. Kudos to Laco for releasing such a beautiful model! Thank you so much for this in depth comparison of two great watches! Great review. I have been waiting for a comparison like this as I am trying to decide between the two and this is really helpful. I am leaning towards the Laco as I'm not sure if the IWC is worth 2-3x the price considering they are so identical. Even though I am a bit of a brand whore so I do want the IWC name. But when you say the IWC finish is slightly better what exactly do you mean? Thx. Well, the overall feel of the 3717 somehow feels more complete and balanced. For a start, a true pilot watch is supposed to be anti-magnetic but the laco isn't. Next thing is minor. It's the minute details, actually. The edges on the 3717 are polished, or rather has a polished border, like the perimeter or circumference of the case. While the laco is just polished theoughout. But these are really minor details IMHO. Oh actually, in hind sight, the laco probably have a slight edge in finishing. The movement is decorated, thanks to the see through case back. The 3717's is not decorated, irrc. You can try contacting Gnomon Watches. They have a shop at Shaw Tower, Beach Road. I notice you also have reviewed the Steinhart Nav B-Chrono and the Gold Edition. How would you compare the Laco Kiel to the Steinhart? Other than the size difference, are there any other difference worth noting? I think the Steinhart is about 30% cheaper than the Laco. Which one would you recommend? The steinhart nav b chrono is actually around 50% cheaper than the laco Kiel. But in terms of finishing, the laco is far better than the steinhart, IMHO. The lugs on the laco Kiel are curved. This makes the watch hug the wrist better. There's less or hardly any overhang, especially on smaller wrists. However, the lugs on the steinhart nav b chrono is straighter, hus, more overhang. Basically, you get what you pay for. The laco Kiel feels more solid somehow. The steinhart nav b feels a little hollower somehow. If you prefer a brushed stainless steel case, then it'll have to be the steinhart. But if you prefer a polished case, then it'll be the laco. It's your cash, your call, but I reckon you should try both, fiddle with them physically and decide from there. Such a great review! I do as well love my 3717, such a brilliant classical pilot design. I agree also that it is hard to find nice strap for 21mm lugs. I do like your strap choice. could I ask you where did you get it as I will like one for my IWC? Thanks. The straps are from gnomon watches. Made by rios. Thanks for a great review. Very informative. I've been looking at the Laco, a Sinn 103 St Sa and the Steinhart Nav B and think the Laco is nudging ahead of the other two.